We know what it's like to spend the first 30 minutes as a new patient trying to remember everything we need to know about you. Try this instead. Click the links below, print our our forms and fill them out in the convenience of your home. This is a quick and easy two page record of your personal medical and dental history. 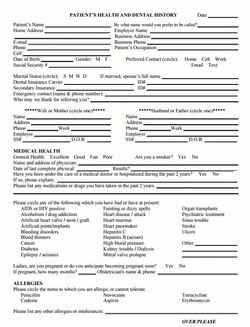 It is of utmost importance that you fill this form out completely and legibly! Medicines that you are taking, or conditions that you have, may be aggravated by even the most routine dental care. Help us to help you by giving us all the information you can; please feel free to contact your physician if you are unsure of your medicines. Sometimes people need to transfer their records from Dr. Meyer's office to another dental office. We will be happy to prepare a copy of your records for transfer to another office, usually at no extra charge to you. 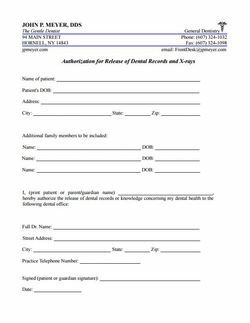 Print out and sign this one page form, and then fax or mail it to us with the address of your next dentist, and we'll take it from there! Your previous dental records are helpful to Dr. Meyer. 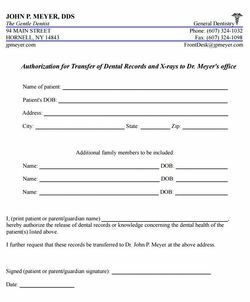 Use this one page form to request a copy of your records and XRays from your previous dentist to Dr. Meyer's office.